With China’s credit train headed for the abyss, stoked on WMPs, and WMPs of WMPs, the latest product to hit the market are crowdfunded WMPs. The more people sign up, the higher the higher the interest rate paid, and the more money gets ploughed into more infrastructure/property/oversupply industry projects. 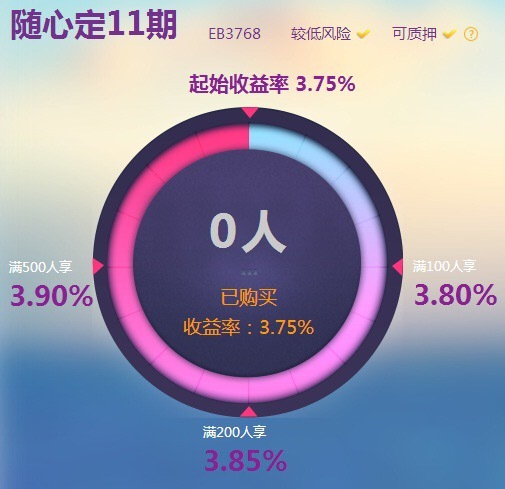 China Everbright Bank launched the first crowdfunded WMP (wealth management product) in June this year, and since then has sold 11 plans under its new “Suixin Ding” product line. (Loosely translates as follow one’s inclination subscription). The latest and 11th plan is a floating rate unguaranteed WMP. In other words neither the return of principal nor the projected yield are guaranteed. The term period is 84 days, starting 19th October and finishing on 11th January 2017, while China Everbright acts as the issuer and trustee bank. Although the subscription period was open for eight days until 18th October, it was all over in just a few hours on Tuesday morning. 90 seconds after the opening bell at 10am, the WMP had already attracted 211 subscribers. Each subscriber must invest a minimum of RMB50,000 (US$7,435), and in increments of RMB10,000 (US$1,481) thereafter. After the first hour 523 investors had already subscribed, meaning the maximum projected annual return of 3.9% had been achieved. By lunchtime the WMP’s subscription target was hit, a whopping RMB100mn (US$14.9m), and it was closed with 854 subscribers. So where are the funds invested? Repos, inter-bank lending, money market funds etc. Repos and inter-bank lending can be used for liquidity management purposes. Domestic and foreign issues, listed bonds, financial bonds, central bank bills, short-term financing bonds, medium-term notes, enterprise bonds, corporate bonds, subordinated bonds, convertible bonds, exchangeable bonds, perpetual debt, principal protected notes, asset-backed securities (including but not limited to ABS, ABN, CLO, etc. ), financial direct financing instruments, bond repurchase and other varieties, and any other bond market financial instruments that the CBRC allows WMPS to invest in. Funds will not be invested in domestic market traded bonds with credit ratings less than AA, short term financing bonds rated lower than A-1, or overseas market traded bonds with ratings less than BBB. The funds can be invested via financial institutions permitted by state laws and regulations, including trust companies, securities companies and their asset management subsidiaries, fund companies and their subsidiaries, and insurance companies; and invested in, but not limited to, preferred stock, preferential return structured equity products, equity pledge lending, revenue rights from stockbroker securities lending and borrowing, trust loans, corporate finance projects with fixed-income return characteristics. Derivatives such as interest rate swaps and credit default swaps. Investment in derivative products is limited to hedging and arbitrage purposes, and credit default swaps can only be bought for credit protection. No less than 30% shall be invested in bank deposits, money market instruments, and fixed income products. Fund allocation to new share subscriptions and other fixed income assets shall not exceed 70%. Investment in overseas bond markets shall not exceed 10% of fund allocation. Investment in derivative products shall not exceed 50% of the fund’s net asset value. Open repo amount must not exceed 40% of the fund’s combined assets. The aforementioned investment scope is subject to change in accordance with state laws and regulations. In such cases, investors will be notified via the bank’s official website (www.cebbank.com). So these funds are not just being invested in vanilla debt instruments, but structured products and project finance. Based on the investment scope, in theory 70% of the funds could be invested in local government financing vehicles via the new ‘industry fund’ runaround. (Explanation on the new flow). It is unlikely all the Chinese investors are aware (or even care) where their funds are invested. Chinese investors are busy chasing yield, as savings rates have been kept artificially low in China. For example, China Everbright Bank’s three month time deposit rate is 1.4%. The casino style graphics and rush for a piece of the fund play well to the Chinese gambling mentality to investments. “Bank WMPs are different to bank deposits, and risky. This product contains the following risks: credit risk, interest rate risk, liquidity risk, policy risk, management risk and information risks…China Everbright Bank does not guarantee any of the WMP returns”. Most China watchers believe that in the interests of maintaining social stability, the Chinese government will not allow a wave of WMP defaults. Another more pressing need is maintaining liquidity in a slowing economy, which receives RMB16tn (US$2.4tn) in financing from WMPs. (Article not to be copied without permission. Please kindly cite the site). Next Spot-lite: Who really owns Jilin Jiutai Rural and Commercial Bank?